Are you looking or a great sun wall to keep your gazebo protected and comfortable? Do you want a way to keep your family safe from the sun while you’re enjoying your time outdoors? Would you like something that’s affordable and easy to use too? If so, you’re in luck! In this article, we’ll introduce you to a sun wall that’s sure to meet all your requirements and much more, too. This sun wall is made by the Ozark Trail brand and will quickly become an important part of your backyard setup. The Ozark Trail Brand is a well-known brand name that makes the Ozark Trail Sun Wall as well as a variety of other great outdoor products. This company is dedicated to providing quality outdoor items at an affordable price, and it’s a great option for anyone who is just getting started in the world of backyard or outside exploration. With such a great company to back up this product, you’re sure to find something to love about it from the moment you first start exploring your options. Check out our review below and learn a little bit more about what makes this sun wall such a good choice. We’re sure you’re going to love what you discover! 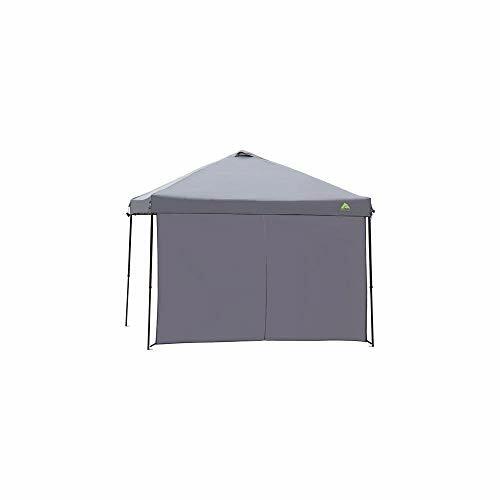 The is a durable and sturdy piece of fabric that is designed to work as a single wall for any 10x10 straight leg metal gazebos. The wall is quick and easy to attach to your existing gazebo and can be taken down just as quickly when the time comes, too. Available in a nice, neutral dark gray color, this sun wall will fit in well with any existing backyard decor and keep your whole setup looking great and feeling comfortable throughout the hot summer months. This suns all is designed to fit 10x10 straight leg gazebos and, as such, it is a large square panel of fabric. The sun wall is UV resistant and able to hold up to a lot of wear and tear in the sun, rain, wind and more. Although the sun wall doesn’t come with any ties or other items, you can easily use bungee cords or some other method of attachment to roll it up and down as needed. It only takes a few minutes to install this product and get started using it right away. We like how well this product stands up to weather. Although it isn’t exactly meant for long-term daily use, it tends to do well in this type of situation too, simply because it’s made well. The fabric is thick and sturdy enough to get the job done right without making it too hot or stuffy inside the gazebo. All in all, this is a great, durable sun wall that we appreciate because of how well it protects anyone inside the gazebo from the weather outside. We feel that the only real flaw with this sun wall is that it doesn’t come with everything needed to get started using it. It has built-in anchors for the corners of the sun wall, but in order to really secure it in place or to use it by rolling it up or down, you will need to buy some additional fixtures. We feel that this product could be greatly improved by simply including something to make all of this possible without expecting customers to spend more money on additional items before hanging it in place. This product is lightweight enough to be able to be hung in place and removed without help from another adult, if necessary. It’s easy to keep this product clean by rinsing it off with a hose and scrubbing it every now and then with a mild dish soap and warm water. It’s possible to use this sun wall in conjunction with two other sun walls to create a three-sided canopy gazebo experience that will further protect anyone who might be inside. This product is easy to roll up and down as needed and is a very versatile addition to any backyard gazebo. The sun wall doesn’t come with any clips or other types of attachments necessary to hang it, so you’ll need to purchase these separately if you want any specific attachment options. Some customers feel that the fabric is too thin for what this product is, although it’s thick enough to get the job done very efficiently. In some instances, the sun wall may not reach all the way to both sides or to the ground on specific types of gazebo canopy frames, and this may let too much sun or rain inside depending on your situation. This sun wall may, in some rare instances, arrive damaged during shipping or storage. So, have you decided whether or not this sun wall is right for your needs? There are a lot of great reasons to bring home a sun wall like this one today, but it may not be for everyone. If you don’t have the right type of gazebo, for example, there’s no need to spend your money on something like this unless you plan on DIYing it so that it fits with your existing gazebo instead. Remember that this product is sized for a 10x10 gazebo with straight legs and a metal frame, so anything else may not work as well. Keeping this in mind, however, we do recommend this product highly if you have the right type of gazebo for it. We feel that this is a good, durable sun wall that can work well as a single piece of fabric or in conjunction with a couple of others to provide a secure place for you and your family to relax outdoors. Whether you choose to use this sun wall by leaving it in place all summer long or you’d rather put it up and take it down as needed, this is a sturdy product that will make your outdoor experiences much better overall. Just remember to keep up with your regular cleaning and maintenance of this product to help it last as long as possible. A little cleaning goes a long way, so be sure you rinse it off a few times throughout the season and give it a good scrub before you put it away for the winter months, too. With a little bit of planning and care, you’ll be able to use your sun wall for several summers without having to worry about it becoming damaged or wearing out too quickly to be useful.